On March 26th, 2016, the day before Easter, a young boy called 911 operators to request the assistance of Sault Ste. Marie Police. His Dad, Tim Mitchell, had been drinking and was talking about ending his own life. According to Tim’s young son -one of two sons ages 14 yrs. and 13 yrs. that were in the home when the beating took place, his Dad was outnumbered. Amy-Lee hasn’t spoken with the police about the event. 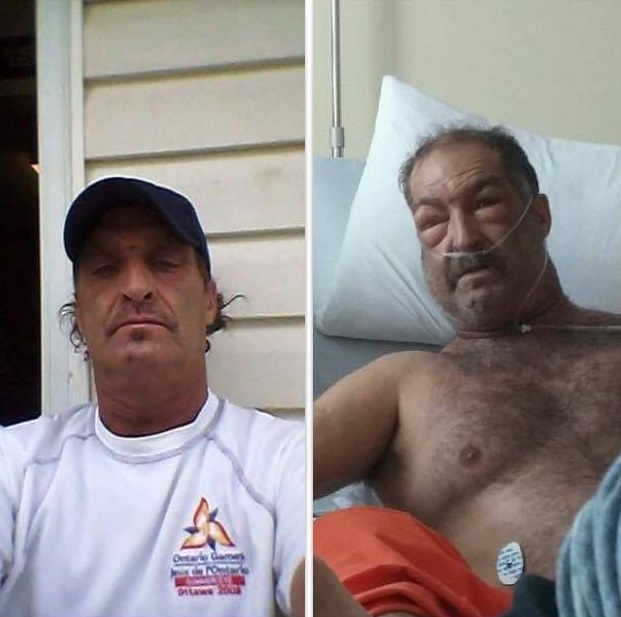 Tim spent two days at the Algoma Remand Centre with all of his injuries unattended. 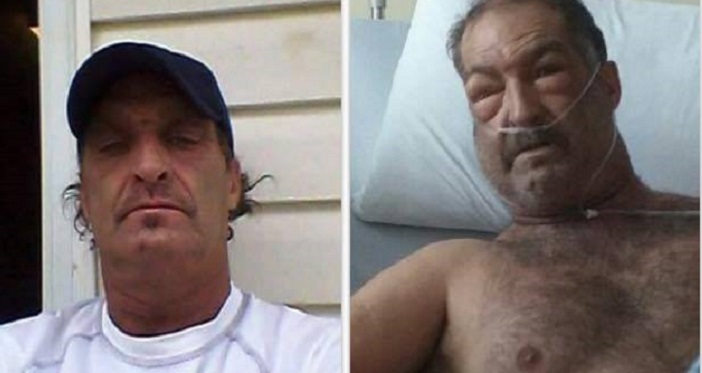 His condition worsened and on Monday, two days after the beating, Tim lay on the floor of his cell. Family members say that he thought he was going to die that day. Tim Mitchell, picture of the results of his police beating on Saturday, March 26th, 2016. Unable to breathe, the jail returned him to the hospital. As Tim was being admitted to the hospital, Amy-Lee was sitting in the Sault Ste. Marie Courthouse for her Dad’s bail hearing. The Special Investigations Unit from Toronto has been dispatched to investigate Tim’s beating from Sault Ste. Marie police officers. This Sunday, April 3rd, 2016, Tim took a bad turn and required emergency surgery. He has been in an induced coma and on life support for the past three days. According to Amy-Lee, Tim is stable today “for his condition”. “He had been complaining about his stomach for three days before they gave him a CAT scan and found the leak,” added Amy-Lee of the discovery that feces had leaked into her Dad’s stomach. The Northern Hoot will update readers as events develop.